This is Miguel Angel Cano, looking at my little present for buyers of my instruments, a wooden string winder. Miguel is the owner of Guitarras de Luthier a guitar shop in Madrid which is situated right next to the Conservatory. Miguel started selling my instruments in 2013 but we had never met. Until last week. This is David González playing Homenaje a Toulouse- Lautrec by Spanish composer Eduardo Sainz de la Maza. The recording is made in Guitarras de Luthier, a guitar shop in Madrid. I think he plays it beautifully. 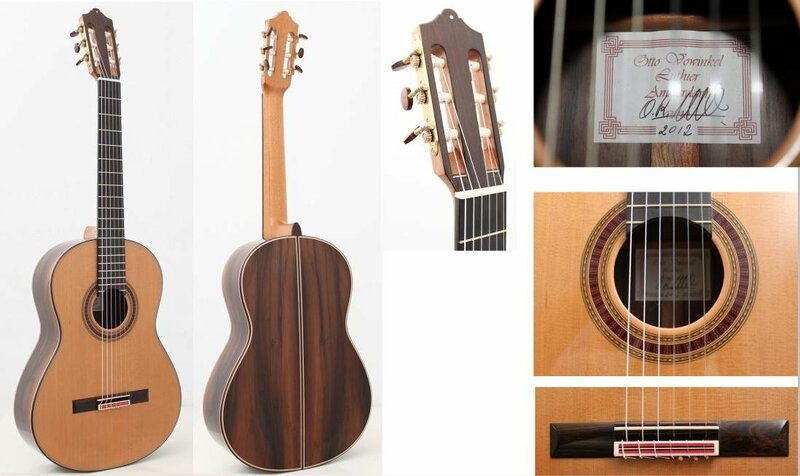 Guitarras de Luthier is a guitar shop in Madrid where, according to their website, ‘you can try and compare concert and studio guitars from the best luthiers’. So I am happy that they sell my guitars as well. In Spain you can find my instruments in two shops. Guitarras de luthier in Madrid and Casa Luthier in Barcelona, about which I will write something next week.